Where is Lovell and what is the town like? Lovell is a small village located in western Maine near the New Hampshire border. In the late 1800s, Lovell became a summer resort area when city dwellers from Boston and New York began building cottages near Kezar Lake for their vacation homes. Today, it remains a picturesque, rural town. There are many beautiful lakes, streams and woodlands in the area, but Kezar Lake is the jewel in the crown of the Lovell area. Nearby towns include Fryeburg, Bridgton, Bethel and North Conway, NH. How close is the house to the lake? Can you see the lake from the house? The house is set back from the lake by approximately 250 ft. There are no other houses between our house and the lake. The backyard, which is on the lake side of the house, is open and grassy and a buffer of trees runs between the yard and the lake. The back of the yard is bordered by a shared dirt path which leads to the beach area and boat launch area. The house is built on a slight knoll which affords the house a view of the lake, though partially obstructed by pines, oaks, shrubs, and blueberry bushes. An open deck overlooking the yard is accessed through three sets of sliding doors in the dining area and living room and is outfitted with table and chairs, a great spot for morning coffee or evening cocktails. Can you describe the area in which the house is located? Is it private? What about the Kezar Lake House itself -- how close is the nearest neighbor? Our home is located on an unpaved cul de sac with two other homes. The house is sited on a 1.3 acre lot with two driveways on the cul de sac side of the property and an open backyard on the lakeside. We have a neighbor on one side only. You can see the neighboring house, but it's screened from our house by landscaping, it's more visible in winter than summer. What does it mean that the waterfront is shared? The 25 or so residences at Westways share the community's amenities: beach area, 4 docks, 2 swimming platforms, rec field, etc. (And a few of the homes do have private docks, we do not.) Because the docks are spread out along the 1/4 mile waterfront and families tend to use the dock nearest their home, you're not likely to have more than a few families at any one dock area at a time, and often you'll find you have an area completely to yourself. There is a shared dirt path that runs across the back of our yard -- so you'll likely see folks walking the path to go to the beach or dock. Does it get crowded during the summer? Well, summer is certainly the most popular time of the year at Westways -- but, even then, this is not a densely populated area. You'll likely see others walking the paths or at the waterfront, enjoying the peaceful setting Westways offers its visitors. The most "crowded" areas you'll likely see are (1) the small, sandy beach area on a warm summer's day, when families with young children are playing in the shallow water; and (2) the softball field on Thursday nights when Westways plays host to a community softball game that welcomes all. What is the lake like? Can we swim? This 2,500 acre lake is a truly special place -- magical and hidden. 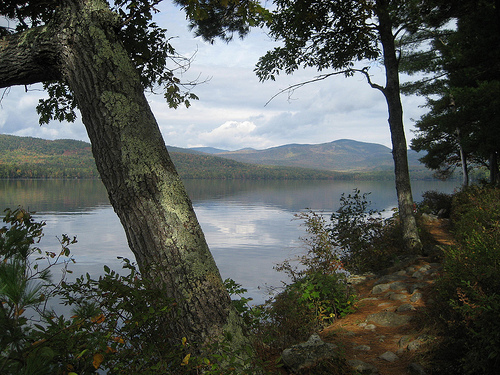 Unlike many lakes where a main public road runs along a shoreline, Kezar Lake is very private as it's nestled into the forest, against a backdrop of mountains. So, when you're driving through Lovell on the main road (Rt. 5), you'd never even know it's there. The upper bay (where our house is located) is a deep (155 ft.) basin. This upper bay is connected via the narrows to a broad, shallow (10 ft.) lower bay. The lake water is crystal clear and suitable for swimming, boating, and fishing. While much of the shore at Westways is rocky, there is a small, sandy swimming area with a very gradual entry which is perfect for younger children. Older children will enjoy swimming from the docks to the swim platforms. The lake is 7 miles long and you can boat the length of it. The lake is shared by water-skiers, pontoon boats, fishing boats, kayaks, and canoes. (Jet skis, however, are not welcome.) We provide one canoe and two kayaks for your use. Adult and child-size floatation devices are also provided. A marina is located at the narrows and offers boat rentals (contact the marina to see when you should reserve a boat, summer rentals are popular). You'll also find a restaurant and ice cream stand at the marina. Due to the lightly developed shoreline, wildlife abounds...moose, deer, and loons frequent the area. Can we dock or moor our boat on the lake? Yes, you may dock one power boat at our shared dock with prior arrangement, up to 20 ft. and not including pontoon boats. When you make your reservation, let us know you'll be bringing a boat and its size. Our assigned dock is located at lakeside field. There is an additional damage deposit if you bring a boat and you must notify us at the time of booking. What house supplies are provided? We provide toilet tissue and trash bags. In addition, the kitchen is generally stocked with basic supplies (spices, cooking oil, plastic/aluminum wrap, dish detergent, dishwasher detergent, cleaning supplies, etc.) that you're welcome to use. We just ask that if you use something up you replace it for the next guests. Do you include bed linens and towels? Sorry, no, we don't include bed linens/towels. We do provide blankets, comforters, quilts, duvets, and pillows. For bed sheets you'll need to bring: 1 set king, 3 sets queen, 1 set full, 4 sets single (for bunkbeds). Anything special we should bring? In summer, you'll want to bring beach towels and, possibly, beach chairs. Also, we do have a collection of DVDs and videotapes at the house. Is there a telephone? Will my cell phone work? Two telephones and one answering machine are provided. Local calls are included and you can receive incoming calls -- both local and long distance. For outgoing long distance calls, you'll need to use a calling card. We leave a calling card that you're welcome to use if you forget to bring one, but we can't guarantee how many minutes will be left on it. Our cell phones don't work at the house or in Lovell, but do work in some nearby towns (our provider is Verizon). Do you have cable/satellite TV? Sorry, no. But, we do have a 39" flatscreen TV with DVD/VCR so you can watch a DVD or videotape. Yes, we provide complimentary Wi-Fi Internet access via DSL. Just bring your laptop. Who would enjoy vacationing at the Kezar Lake House at Westways? We have found that people of all ages enjoy a Westways vacation - especially those who love the outdoors, the quiet setting, nature, and active pursuits like swimming, boating, fishing, hiking, skiing, etc. However, if you're looking for nightclubs or a party spot this is not a good fit for you. It all sounds great! What do I need to do to confirm my reservation? Will you hold dates for us while I check with other members of our rental group? Unfortunately, we are unable to hold dates - unlike a hotel or resort, we just have this one home, so we rely on a first come, first served system. However, if you're considering certain dates but are not ready to commit, let us know and we'll be happy to let you know if/when other inquiries come in for the dates you're considering. What is your Damage Deposit policy? We require a $2,000 damage deposit for all stays. This amount is collected when your balance is due and refunded within 14 days of your visit, assuming you leave the house as you found it, follow our checklist of house closing procedures, and abide by the terms of the rental agreement. In the event of a cancellation, you forfeit any money that has been submitted towards the rental, excluding the refundable damage deposit. If we are able to re-rent the house during a cancellation period we will return all payments with the exception of a $100 cancellation fee. Again, because we have just this one home, if you reserve specific dates, we turn other guests away for those dates. Our cancellation policy is firm, so we strongly encourage you to obtain travel insurance in the event you need to cancel your reservation. We use travel insurance ourselves when we go on vacation. You can check http://www.insuremytrip.com/ to compare rates from several insurers. What do we do if there's a problem upon arrival or during our stay? You may contact us at any time, day or night, and if you can't reach us you can contact our local caretaker. We'll do our best to resolve any problems as quickly as possible. Do we need to take the trash home with us? Yuck! Absolutely not, we have trash picked up on Sat./Wed. Just leave the bagged trash in the receptacles in the garage, and leave the garage doors closed. We do recycle, however, so you will need to separate the recyclables (glass/cans/newspaper) from the rest of the trash. When does the lake freeze? Can we ice skate on it? Due to its size, Kezar Lake freezes up after the smaller, more shallow ponds -- generally in mid-January, but of course it's weather dependent. Due to the amount of snow we usually receive, skating tends to be better on a rink, such as the one located at Sunday River Resort, or Ham Arena in Conway, NH. How far is it to the nearest ski area? Will there be snow? Shawnee Peak is the closest at 20 minutes away, and is a smaller, family-oriented area with great views from the summit; they also offer night skiing. Sunday River Ski Resort is 30 minutes north of us and provides what they call (and we've found to be) the most reliable snowmaking in the east. Sunday River has lots of terrain and variety to please novice to expert skiers and snowboarders. Feel free to call (508-397-2399) or email us (info@kezarlakehouse.com). We're happy to answer any questions you might have.